When my mother hired the DJ for our reception I'm not sure she knew exactly what he was going to do. Thankfully he didn't try anything way out of order and he stuck pretty much to a traditional kind of agenda. 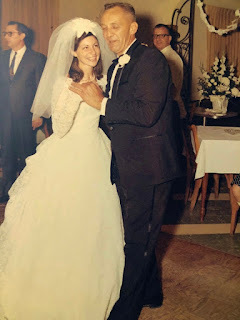 When he called for the bridal party to gather on the dance floor, I don't think any of us knew exactly what he was going to do--least of all my father. My dad was a great outdoors man. He loved to fish and hunt. 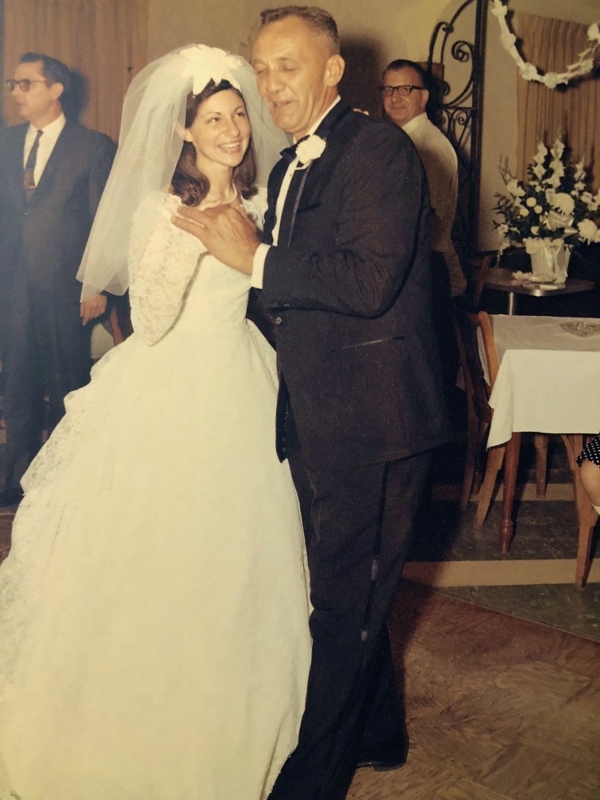 Some of the favorite stories my mother told about their dating days were about her having to learn how to bait a hook with a worm as my dad threatened to put it down her back if she didn't put it on the hook. She learned to bait a hook and catch a fish but it took her seven years to finally catch my dad. When she did, the story goes that he used her wedding veil to make a minnow net to catch minnows for bait. Now, never once in all that dating time did Mom ever mention his taking her dancing. And in all the time that I lived at home, there was never any dancing that I saw. All of that leads to one of my favorite memories of our reception. Bob and I did our bridal couple dance and then the DJ told my mom and dad that they needed to break into the dance and partner with us. My dad walked up to me and I put my hands on him in dance position. He looked at me with a crooked smile and said, "What do I do?" "Just move your feet," I said and he did. It was a special moment. I'd grown up learning to fish and had special memories of ice fishing with him as well as fishing from his boat and the shore. But this was different. He did something for me that was way out of his comfort zone. I look at the picture and his smile and I can't help but think he had fun doing it for me. Truly it was a special moment.